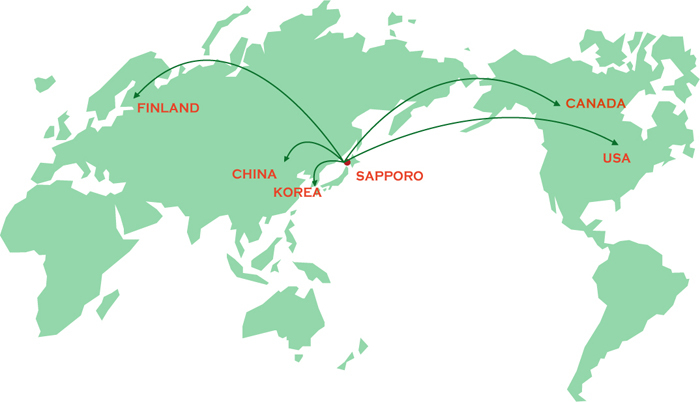 Sapporo Medical University promotes international exchange programs mainly with northern countries and Asian nations that have similar climates and living environments to promote the health and welfare of people in Hokkaido and world wide. The university has concluded exchange agreements with Canada, China, Finland, and the United States, and has dispatched and hosted researchers since 1977. Students have participated in language courses at the University of Alberta since 1999 and mutual exchanges for clinical training programs with students from China Medical University and The Catholic University of Korea have also been conducted since 2009 and 2011, respectively. To improve standards of health and welfare for people worldwide, our university actively dispatches researchers to developing countries and welcomes trainees from overseas. We dispatch teaching staffs to areas affected by large scale disaster upon relevant organizations. And we are entrusted with “Training Program for Japanese Descendants” by Japan International Cooperation Agency (JICA), and has been accepting doctors from Sakhalin Oblast as a trainee.